Islamic Center of Richmond (ICR) is a registered 501(c)(3) non-profit religious organization located in Henrico County - Richmond, Virginia. Since 2007, ICR is serving growing muslim community in Greater Richmond area in multiple facilities spread across Hungary Rd & Mayland Dr. This includes Daily Salat, Jumua, Ramadan daily Iftaar, Dinner & Tarawee prayers activities, Full- time/Part-time Hifz Program, Sunday School, Weekly Halaqa for the youth, Tajweed & Hadith classes for both brothers and sisters. Also, ICR supports refugees and many needy families through-out the year from Zakat and Sadaqah donations. Currently, ICR provides all religious, educational & charitable services to hundreds of Muslim families in many rented facilities and need urgent funds to complete construction of its Masjid Project. ICR acquired 5.17 acres of land in July 2011 at Hungary Rd and Alhamdulillah paid off immediately in short period of time with the help of generous donations from the local community. To start the construction of Masjid project, the Site Plan was approved by Henrico County in June 2014 which includes installation of pipes for Storm Water, Sewage lines & grading of land to build the parking lot. Alhamdulillah, with the help of local community, contruction of Site work, Water connection and building of Steel structure completed in Jan 2016. Currenlty, ICR needs additional funds of $450k to continue and complete the constrution of Masjid project by Ramadan - June 2016. Approx. $100k is needed urgently by end of March 2016 to purchase bricks and metal studs to build exterior walls of the Masjid. Remaining funds will be spent in the upcoming months to complete HVAC, Electrical, Plumbing & other essential interior work. Completion of this work by June 2016, will immensely help ICR and local community to obtain temporary occupancy certificate from the County and conduct Ramadan prayer activities in the New Masjid Inshallah this year. Also, will help ICR to consolidate all its programs under one roof and cut down huge operational costs by moving away from rented facilities whose lease is expiring in Sept 2016. ICR would like to make an appeal to all internal & external communities to help & support with your donations in building "House of Allah". Your generous contributions will be immediately utilized for the purchase of Bricks and complete building walls of the Masjid. This is an excellent opportunity of Sadaqah Jariyah as the donors will continue to receive rewards as long as the masjid is standing and people praying, reciting Quran, doing dhikr and gaining knowledge in this world. Alhamdulillah with all your generous donations and blessings of Allah swt we were able to successfully complete the EFIS and Roof work of Masjid Yusuf. Also, Installation of Door & Windows has been completed. Alhamdulillah an important milestone of construction with respect to exterior work is now completed before the severe winter kicks off. As some of you already know we have started working on the next phase of construction of Masjid with interior work. 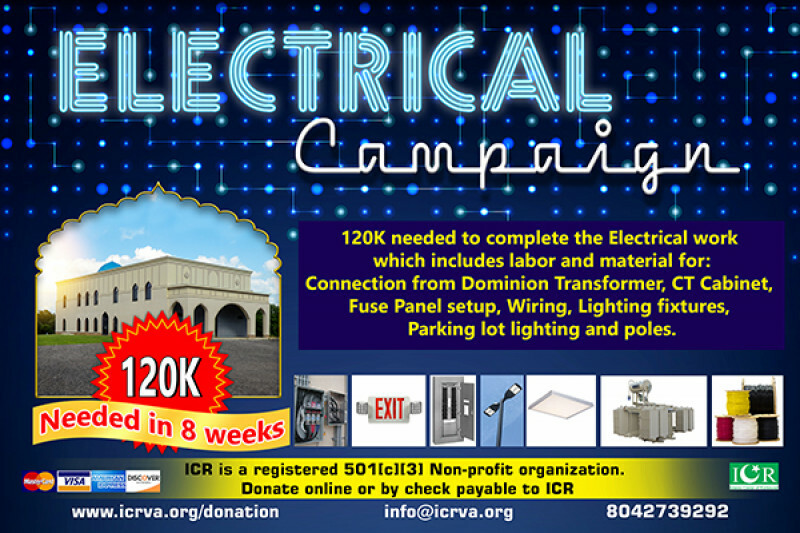 We have launched a new campaign to completing the Electrical work of $120k which includes CT Panel, Electrical wiring & Light Fixtures. We are in urgent need of funds to complete this work to bring electricity to the Masjid. In earlier days, the Mosque of Prophet [PBUH] was lightened by burning tree branches –especially of date tree. When a Companion of the Prophet, Tamim al-Dari [RA], brought the oil-lamp to Madina from Syria, it started to be used to lighten the mosque. Tamim al-Dari [RA] was praised by the Prophet [PBUH] due to his service to the community. The Prophet [PBUH] made dua: “You have illuminated our Masjid. May Allah Ta’ala illuminate your life.”. In the reign of Umar ibn al-Khattab [RA] large oil-lamps were hung up on walls and thuribles were placed in the mosque. The electricity was first used in 1908 in the Masjid al-Nabawi. Since then electricity has reached scores of Mosques. Now its the turn of Masjid Yusuf to get the electricity needed for the House of Allah. "Help us illuminate the House of Allah"
Alhamdulillah we made a Jummah appeal recently in Laurel, Maryland on Friday 10/14 and community members from Islamic Community Center of Laurel - MD has donated $3K towards this urgent appeal. May Allah accept their donations bless their families. Currently $105K is needed to complete the Electrical work and so far Alhamdulillah we have raised $15k in past 4 weeks. Please encourage your friends and relatives to spread the word and request them to contribute generously for this effort. Alhamdulillah we had a Jummah appeal in Laurel, Maryland on Friday 10/14 and Islamic Community Center of Laurel had donated $3K towards this urgent appeal. May Allah accept their donations bless their families. Please encourage your friends and relatives to spread the word and contribute generously for this effort. As-Salaamu Alaikum Brothers & Sisters, By Grace of Allah, Alhamdulillah the installation of Brick work around the exterior walls of Masjid Yusuf is close to completion. ICR is now in need of urgent funds of $85k in upcoming next 6 weeks to cover the installation cost of Windows, Doors, Lentils and Glass partition wall for the Mezzanine Floor. Please donate generously and spread the urgent need of funds within our community. This will help to complete the exterior phase of construction work before the start of winter. JazakAllah for all your continued support in this project. May Allah bless & reward you & your family for this effort. Alhamdulillah, the goal to raise $100k funds for the purchase of bricks and metal studs has been successfully completed! Installation of metal studs work is in progress. $190k needed for the purchase of materials for Masjid Dome, Roof, Door & Windows. Inshallah this will help to complete the remaining exterior work. Please continue to donate generously and spread the word within your friends and families to raise funds for this project - Jazakallah! Will you please provide an update as to the work being done? It seems to be at a standstill, but I would like to see this work completed. It is near my home and I have often thought that if I saw workers or others there I would offer some small contribution - even coffee or hot tea to a worker on a cold day can make a difference. But I don't want to promise funds if it has been abandoned. Please let me know.